The season featured the debut of Reebok's new Rbk Edge hockey jerseys. This was the first league-wide uniform innovation in the history of any major North American professional sports league.Seven teams (Boston, Tampa Bay, Vancouver, Washington, Ottawa, San Jose and Columbus) unveiled new logos prior to the season's beginning. On March 1, 2007, the NHL announced the regular season would open on September 29, 2007, with the first of back-to-back games in London at The O2 . They were the first NHL regular season games ever played in Europe. Both games featured the defending Stanley Cup Champion Anaheim Ducks, and the Los Angeles Kings (who are owned by Anschutz Entertainment Group, the same company that owns The O2). On September 17, 2007, the NHL announced the first outdoor game in over four years would be played between the Pittsburgh Penguins and the Buffalo Sabres at Buffalo's Ralph Wilson Stadium , home of the Buffalo Bills football team, on January 1, 2008. The event—known as the AMP Energy NHL Winter Classic—was the first time an NHL regular-season game had been played outdoors in the United States , and it set an NHL attendance record of 71,217 people. The only previous outdoor NHL game was the Heritage Classic played between the Montreal Canadiens and Edmonton Oilers at Commonwealth Stadium on November 22, 2003. During board of governors meetings held on September 18, 2007 in Chicago , cities including Las Vegas , Kansas City , Houston , Milwaukee , Quebec City , Seattle , and Winnipeg were discussed as possible expansion destinations. 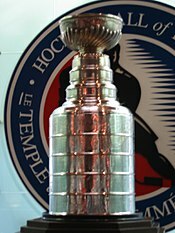 The NHL also discussed the current "unbalanced" schedule and voted on a new schedule format at a board meeting in November, so that all teams will play each other at least once and reduce intradivisional play in the 2008–09 season, in essence returning to the scheduling structure that existed in 2003–04, and would have existed in 2004–05. The sale of the Lightning and Predators teams were not completed for board approval. The New Jersey Devils began playing in their new arena, the Prudential Center in Newark, New Jersey . However, since the arena was not ready by the beginning of the season, they began their season with a nine-game road trip. Mike Cammalleri of the Los Angeles Kings scored the first goal of the season against the Anaheim Ducks on September 29 in the opening game played in London , England . Richard Zednik of the Florida Panthers was severely injured after having his external carotid artery in his neck accidentally cut by the skate of teammate Olli Jokinen in a game against the Buffalo Sabres on February 10. Zednik fully recovered from the injury, but missed the remainder of the season. The greater differential between goals for and against. After the regular season, the standard of 16 teams qualified forthe playoffs. In each round, the highest remaining seed in each conference is matched against the lowest remaining seed. The higher-seeded team is awarded home ice advantage. In the Stanley Cup Finals, home ice is determined based on regular season points; thus, the Detroit Red Wings had home ice advantage. Each best-of-seven series follows a 2–2–1–1–1 format: the higher-seeded team will play at home for have games 1 and 2 (plus 5 and 7 if necessary), and the lower-seeded team will be at home for the other games. On October 3, in his first game with Montreal, Roman Hamrlik played in his 1,000th NHL game. On October 7, Joe Sakic reached 1,591 points, moving him past Phil Esposito for eighth all-time in scoring. On October 8, Chris Chelios played in his 1,550th game, moving him past Alex Delvecchio for eighth place on the career list. On October 11, Mats Sundin scored his 390th goal with the Toronto Maple Leafs and reached his 917th point at Toronto, breaking Darryl Sittler's record as the all-time Maple Leafs scoring leader. On November 27, Sundin became the first player to score 400 goals in a Maple Leafs uniform. On October 12, Jaromir Jagr scored his 1,533rd career point, passing Paul Coffey for 11th in all-time scoring. On October 22, Bryan Smolinski played in his 1,000th NHL game. On October 26, Alexei Kovalev played in his 1,000th NHL game, the third Montreal player to reach this milestone in October. On November 3, Al Arbour coached his 1,500th game with the New York Islanders and earned his 740th win with the team. Both are NHL records for coaching a single team. At 75 years old, he was the oldest man to coach in an NHL game. On November 7, Mike Modano broke Phil Housley's all-time career point record for a U.S.-born player. On November 10, Jeremy Roenick scored his 500th career NHL goal, becoming only the 40th player in the history of the league to do so, and only the third American. On November 17, Martin Brodeur recorded his 500th career win, becoming only the second goaltender in the history of the league to do so. He now trails Patrick Roy who retired with 551 career wins. On November 17, Glen Wesley played in his 1,400th NHL game, becoming the 10th defenseman to do so. On November 29, Jarome Iginla moved ahead of Al Macinnis as the all-time leader in games played for the Calgary Flames with 804 games played. On December 20, Marian Gaborik scored five goals for the Minnesota Wild in a 6–3 win against the New York Rangers. It is the first time a player has scored five goals in a game since Sergei Fedorov did so on December 26, 1996. On December 23, New York Rangers captain Jaromir Jagr recorded his 927th assist, passing Stan Mikita for 15th place on the all-time list. On December 29, St. Louis Blues Paul Kariya recorded his 900th point (377 goals, 523 assists), in a hat trick, to become the 89th player in NHL history to reach that plateau. On December 31, Boston Bruins defenseman Dennis Wideman scored the 18,000th all-time Bruins goal, in a 5-2 home game defeat of the Atlanta Thrashers, as the first Bruins goal of that game. On January 17, Markus Naslund played in his 1000th NHL game. On February 9, San Jose Sharks coach Ron Wilson earned his 500th career win as an NHL head coach, becoming the 11th in league history to do so. On February 19, the Montreal Canadiens came back from a 0–5 deficit against the New York Rangers to win the game in a shootout 6–5, this marks the first time in the franchise's 99-year history that they have ever come back to win a game after being down 0–5. This game was compared to some of the greatest games in team history. On February 26, the Edmonton Oilers earned their 13th shootout win, the most shootout wins by any team since the inception of the shootout. On March 3, Alexander Ovechkin became the first player this season to score 50 goals. He also became the second player in NHL history to score a hat trick in the same game in a 10-2 win over Boston. On March 10, Jarome Iginla scored his 365th goal, passing Theoren Fleury for the all-time goal-scoring lead in Calgary Flames history. On March 11, Andrew Cogliano set an NHL record by scoring an overtime winning goal in the third consecutive game. On March 13, the Detroit Red Wings reached the 100-point mark for the eighth straight season, tying an NHL record set by the Montreal Canadiens from 1975–1982. On March 21, Alexander Ovechkin became the first player to score 60 goals since the 1995–96 NHL season (Mario Lemieux & Jaromir Jagr). On March 22, Joe Sakic recorded his 1000th assist on a goal by teammate Tyler Arnason, becoming just the 11th player to reach this mark. On March 30, Dan Ellis had a 233:39 long shutout streak snapped in a 1–0 OTL to the Detroit Red Wings. This was the fifth longest shutout streak in league history. On April 3, Alexander Ovechkin scored his 64th and 65th goals of the season, moving him ahead of Luc Robitaille's (1992–93) league record for most goals scored by a left wing in a single season. On April 6, Keith Tkachuk scored his 500th career goal, becoming the fourth American-born player to do so. On April 9, Joe Sakic extended his record for playoff overtime goals to eight. On April 12, Chris Chelios played his 248th career playoff game, moving past Patrick Roy for most career playoff games played. On April 27, Brad Richards tied the NHL record for most points in one playoff period, with four points (one goal, three assists) in the third period. On May 4, the San Jose Sharks broke their franchise record for the longest playoff game, losing near the midpoint of the fourth overtime to the Dallas Stars and marking the eighth-longest game in NHL history. On June 4, the Detroit Red Wings won their 11th Stanley Cup, third most all-time, against the Pittsburgh Penguins. With this Stanley Cup victory, three members of the team joined the Triple Gold Club: Niklas Kronwall, Mikael Samuelsson and Henrik Zetterberg. All three players won the other two championships together, Olympic Gold and World Championship, both in 2006 for the Sweden national men's ice hockey team. Red Wings captain Nicklas Lidstrom became the first team captain born and raised in Europe to lead his team to a Stanley Cup title.